For as long as I can remember, I have ALWAYS loved to get mail. As a young girl, I can remember nearly running to the mailbox every day to see if there was anything for me. I loved pen pals, and had at least two from Japan for a time, as well as others from across the United States. If I met someone that lived far away, I would make it my mission to send them mail, and I just loved when it came back in return. I've also been somewhat of a pack rat, and could probably still find most of the letters and notes I've been sent. While each card is special, I still have a box full of letters that I used to write back and forth to my Grandma Hutson. She only lived about 30 miles away in Vandalia, but she knew how much I loved to get mail. I also exchanged letters with my cousin Stefanie, who used to make it her mission to write hers in return on the most unusual things she could find. I still have some letters she wrote on toilet paper. For a time, as I went away to college, I truly tried to keep in touch with everyone I'd ever met. Prior to Facebook, that was quite a challenge. My college roommate's dad used to think I single handedly kept the United States Post Office in business with my Christmas card list. Funnily enough, one of the first questions that Kyle asked me when we started dating was how much money I spent at Hallmark every year. I told him I had NO idea, and if I did, I probably wouldn't do it. I just considered it a hobby. I have to admit that marriage and children have somewhat curbed my ability to send as many notes as I used to. I still love when I have the chance to sit down and write notes, it's just not always as often as I would like. And while I may not send as many notes as I used to, I have been humbled these last few months by the outpouring of support for Grace. Since Kyle's column came out, not a single day has gone by that we haven't gotten a note or a card, either at home or at the newspaper office. It's been amazing. 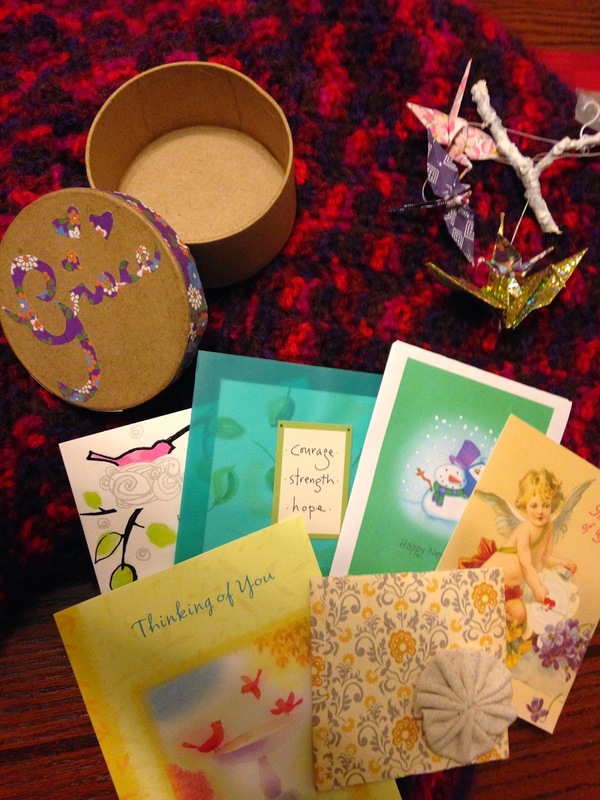 Just a FEW of the kind notes and treasures we have received recently. Some notes contain favorite scripture verses, and others contain sweet messages or letters of encouragement about our journey. I have read and re-read them all many times, and keep them next to my bed, so that I can pick the up anytime I'm down. I hear over and over again how hard it is to live in a small town because everyone knows everything about everyone else. I have to admit that probably has some truth to it. But small communities have their good side too. The support we have received from this community and beyond has truly touched us., and we are so grateful to everyone who has sent a card or a note, left a message on Facebook or said a prayer for us. Your kindness means more than you will ever know. I know there's no way that I will be able to write a card or a note to each person who has sent one to me. Just know how excited I still am every time I go to our mailbox and find that someone has shared their kindness with us. This is so good hear. I love snail mail and love our small town. Thanks again for sharing. I look forward to mail as well. However, I have really fallen behind. I can remember mailing notes to you from Mom's. I haven't been very good lately but hope to get back at it. I love to read all your messages and reread them as well. We are a truly blessed family.